I wrote before about Adoption and why it is so important to me, you can read the first part here. So as you know I am adopted. I was adopted at birth and I had a very hard long road to find my birth family, but after nearly 10 years of searching I finally found them. My search for my birth family is a whole other story for another time. When I was 16 I got pregnant. I gave my son up for adoption right at birth. Today, I have 3 beautiful, amazing boys and one baby girl. Two boys and my girl live with me, and one lives with his family. The way I feel with my own Adoption is that my parents are my parents, that doesn’t change now that I gave up my own son for adoption. He has his own family that he lives with, and two little brothers and sister that live here with me. Accepting that my oldest son had a ‘New’ Mother does not make me love or care for him any less. I love and care for all of my children all the same. He is my son. I gave birth to him. But I stepped down in my role as mother. I am now a birth mother. My children all know each other. My two younger boys know that my oldest son was adopted, well as much as they can understand in their young age. Of course my daughter only being one does not understand, but just as my boys did, she will grow up knowing who her oldest brother is. I am so blessed that they have been able to build, and continue to grow a relationship with him. Having had a child at such a young age truly changes a person. I loved my child the minute I knew I was pregnant, the first time I saw him on ultrasound I loved him more. When he kicked for the first time I fell in love all over again. I still remember his birth, and his first cry. There are no words to explain the feeling that washed through my body at that moment. A moment forever burned into my mind and heart. A moment that truly changed me in ways I never dreamed possible. I never wanted to give my child up for adoption. I loved him so much. I wanted to give him what I couldn’t. He deserved so much more than what I could give him at that time. I know I could have kept him, I would have been a good mommy to him. But was it fair to him? I had the chance to give him what he truly deserved. How could I deny him that? I did this for him, not for me. To say this was an easy choice to make, and has been easy ever since, would be the biggest lie ever. I still struggle every day with this choice. I miss him more than words can say. But I take comfort in knowing that he has the best family. He is in the best place for him. He is so fiercely loved by everyone! He is one lucky and blessed boy! I know I made the right choice for him. If you, or someone you know has been touched about Adoption, I would love to hear your story. I too am a birthmother and an adoptee. Keep writing. Thank you for taking the time to stop by my site. 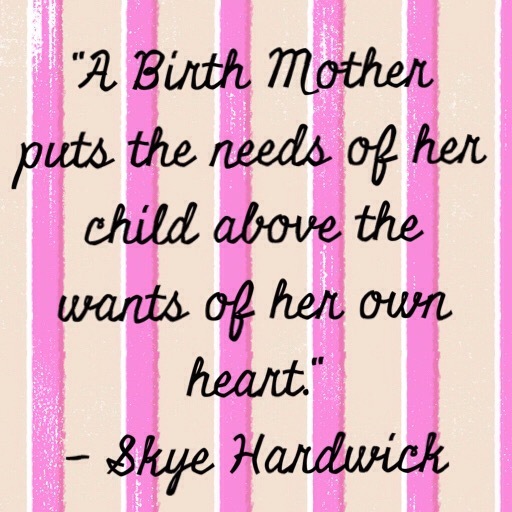 Glad to see my posts are being seen by other Birth Mothers and Adoptees.